Quality Cook Shirts: It’s what you can’t do without! Basic doesn’t mean they’re all the same. Though a cook shirt is just one of the basics, it’s an item that has to look professional and stand up to the job. The fabric used in these shirts is the right combination for optimal drape and weight. That means that the shirts hang well (drapes well), but also have the right weight to hold their shape throughout a long day’s work. The shirts can be customized with your own logo or text in embroidery or in screen printing. Seven font options and 19 thread colors are available for embroidery selections. Screen printing is the process of adding in image by the use of a stencil and gives your shirt long lasting customization. Our size range covers unisex sizes from X-Small to 5X to ensure that there’s a perfect fit for everyone. And we also have a perfect fit for your budget—Aprons and Smocks cook shirts are available at a discount for bulk orders. 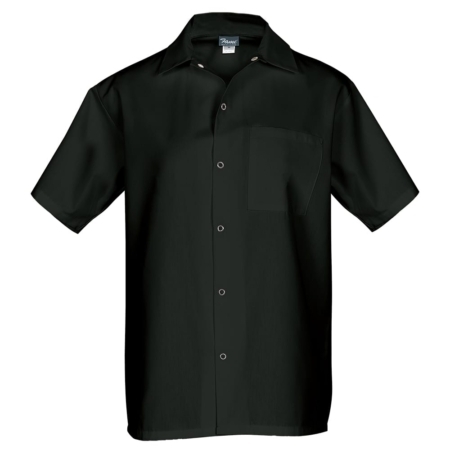 Cook shirts are a basic essential in any kitchen for chefs, bakers, deli workers and back of house workers. Just because they’re basic doesn’t mean they’re all the same. Contact us to make our cook shirts your essential ingredient for your culinary staff.